LAHORE, Jan 23 (APP): Chief Minister Punjab Muhammad Shehbaz Sharif on Monday said services of Chinese engineers, technicians and workers would be long remembered for speedy accomplishment of development projects in Pakistan. He was addressing a ceremony held in connection with the start of traditional Chinese New Year 2017 and the start of spring season, here. 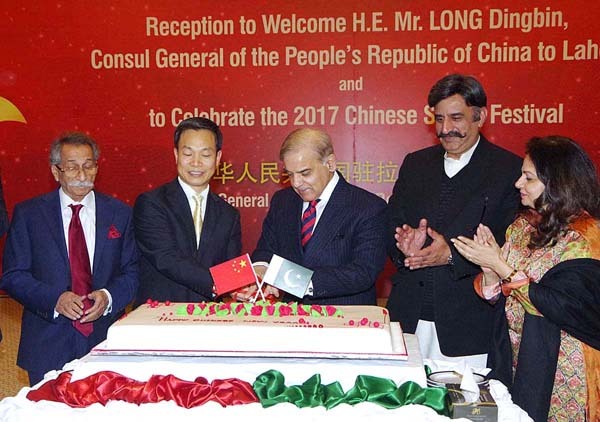 Chief Minister Shehbaz Sharif and Chinese Consul General Long Dingbin cut a cake on the occasion. He said said thousands of Chinese engineers, technicians and workers away from their families were working on development projects in Pakistan and their determination was praiseworthy. He said that Chinese engineers and workers were working on various projects with dedication and their hard work and dedication for Pakistan would be acknowledged in the history. Shehbaz Sharif said the Punjab government would work very closely with Chinese Consul General Long Dingbin and the Pak-China friendship was time tested and China was the trusted friend of Pakistan. He said new world record of speedy competition of development projects in Pakistan was being made and this was the speed of Chinese President. Chinese Consul General Long Dingbin vowed to take forward Pak-China relationship. He said he had received a lot of love and respect after taking over as a Lahore Consul General. He said Pak-China relationship had been transferred into strategic partnership after the launch of CPEC in 2015. He said CPEC would benefit Pakistan a lot that was his second home. He praised speedy completion of 3600 MW gas power projects in Punjab. Provincial Ministers, Parliamentarians, American Consul General, senior officers of Chinese companies and engineers were present on the occasion.